Dashlane's Password Health feature is the easiest way to assess and improve the security of all of your passwords. But some of your online accounts, such as your bank or your email, are more important than others. 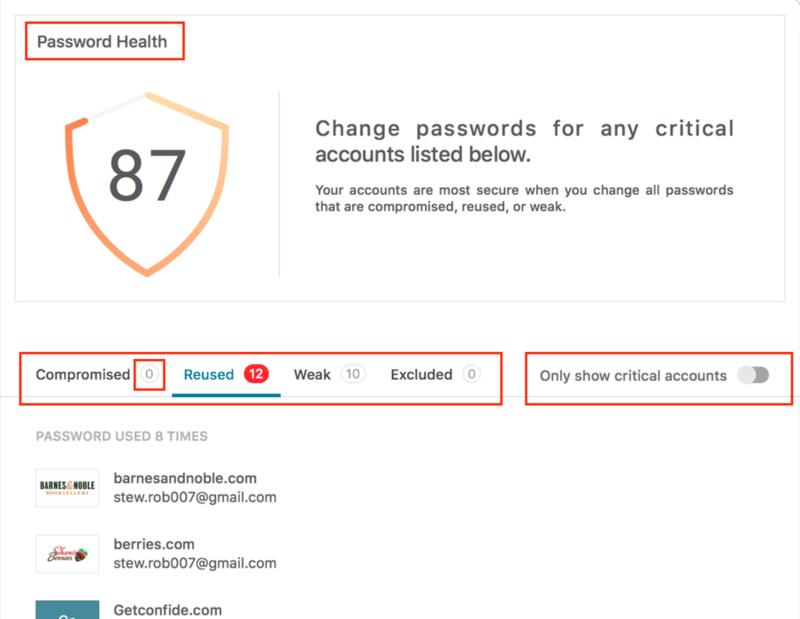 We designed the Password Health feature to help you focus on protecting those accounts first. On mobile, within your Identity Dashboard, click on "Explore" near your Password Health score. At the top you see your Password Health score, giving you an overall sense of how you're doing. Underneath, you'll notice four tabs for passwords: Compromised, Reused, Weak, and Excluded. In each case, a number in a small circle lets you know how many accounts are in each tab. Finally, on the far-right you're given the option to “only show critical accounts”. Note that your critical accounts are given more weight. Also, you will not be given a Password Health score if you have fewer than five accounts in your Dashlane. In addition to the compromised accounts themselves, Dashlane determines if any of your other accounts use the same or similar passwords, and considers these passwords compromised as well. This will remove this account from the calculation of your Password Health score and add that account to the Excluded tab. If you later want to undo an exclusion, simply click on "Include" on the far-right when you rollover the account on the Excluded tab. Reasons to exclude accounts might be because several accounts share the same password through no fault of your own, such as Amazon.com and Amazon.co.uk, or someone has shared a password with you that you cannot change yourself. The switch on the far right, "Only show critical accounts", will filter the accounts in each tab. Because they often handle your most important data, Dashlane defines four kinds of websites as critical: Finance, Shopping, Health, and Social Media. You may recognize these categories, since they are applied by default to those websites when you add them to your Dashlane. Note that a website’s importance is based on our own classification. If you change a website’s category in your Dashlane, either by adding it to or removing it from these four default categories, it will not affect how important it is for your Password Health score.